Gloria Strickland – All Stars Project, Inc.
Gloria Strickland is the Vice President of Youth and Community Development. As a member of the Senior Leadership Team, she plays an important role in establishing the All Stars cutting edge approach to engaging poverty through Afterschool Development and provides input and expertise to ASP program staff and community-based strategies around the country. 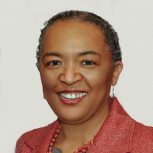 Gloria joined All Stars in 1999 as the founding Director of the All Stars Project of New Jersey, the All Stars’ first regional expansion. With All Stars donors in New Jersey, Gloria has built partnerships with Dun & Bradstreet, Lucent, Investors, PwC, LexisNexis, MetLife, Morgan Stanley and Prudential to launch and sustain the Development School for Youth. Gloria has also played a key role in establishing partnerships with civic and government leaders, including Mayor Ras Baraka, to further expand the ASP performance based approach and programs in Newark. ASP of New Jersey has grown to reach over 2,000 poor youth each year and is supported by more than 1,000 individuals and corporations. In 2013, Gloria was instrumental in the opening of the Scott Flamm Center for Afterschool Development, a 9.2 million dollar 9,000 square foot center in downtown Newark. In addition to her tenure at the All Stars Project, she has held numerous leadership positions, including as the Executive Director of the Somerset Community Action Program, one of NJ’s largest anti-poverty programs. Gloria earned her BA in Early Childhood Education at Hofstra University and received her MA in Educational Psychology from New York University.